After a review cycle has ended, it's important that the feedback gets processed and then shared with every employee. 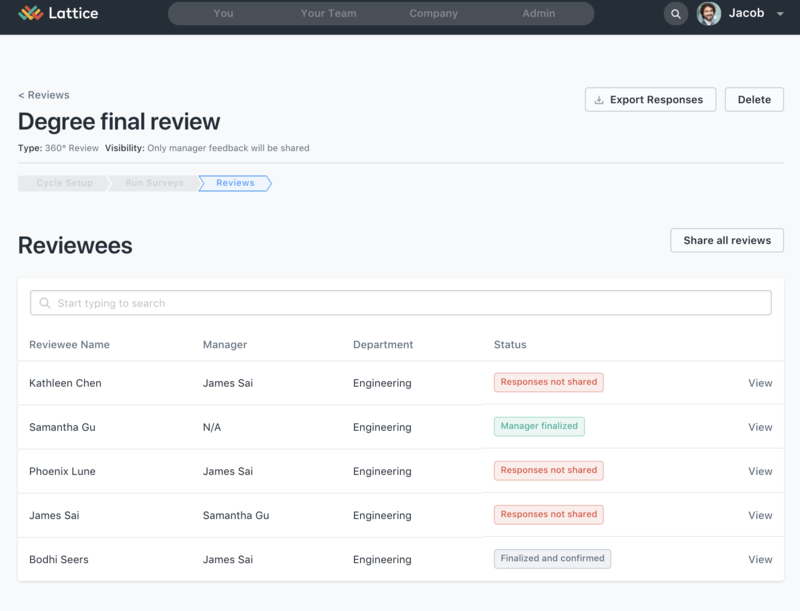 Lattice provides managers and administrators with clear final steps to ensure that all the feedback is collected and provided to the employees once the review is done. Please note that a review cycle does not end when a manager submits their direct reports' reviews. The Lattice admin must end the review cycle. Once the review cycle ends, managers should follow the steps below. Please note, in some cases, a manager may have the permissions to end the review cycle themselves. 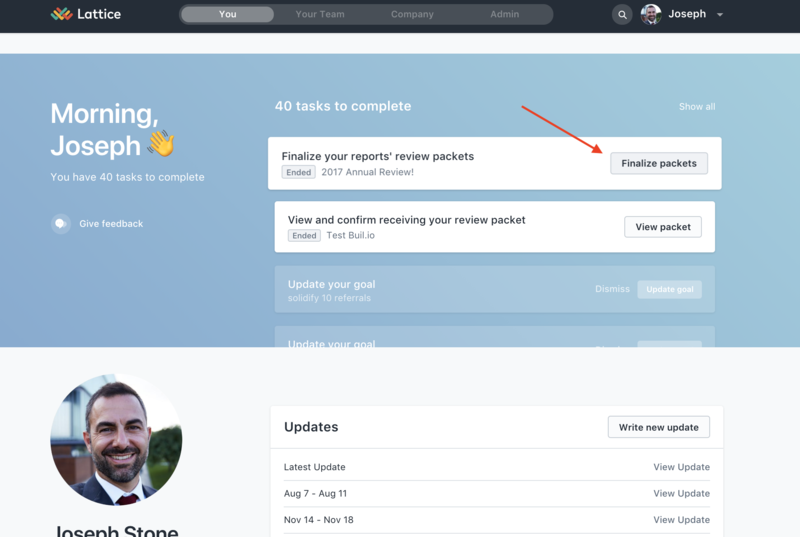 When the review is ended (either individually or en masse), Lattice will send an email notification to the manager letting them know the review cycle has ended and it's time to review responses and share packets with employees. Clicking into "View Responses" will take managers to the Finalize Packets page. By clicking on "Finalize packets," the manager will be taken to the "Finalize Packets" page. Here, they will have the ability on the left hand side to toggle between "Your stuff" and "Your team." Clicking into "Your team," the manager will see a list of their direct reports under "Share results." By clicking in to each report, responses can be viewed on the right hand side in the context panel. Once the manager has reviewed all the responses and feedback, they can now write their final remarks. These remarks can include an overview of the feedback that the direct report received during the cycle, anything that was talked about during a post review meeting, actionable next steps— anything that the manager would like to share with their direct report. While writing a summary, the manager can simultaneously view the feedback on the right side of the screen, to help them write their final remarks. This view also gives the manager the option to download and save a PDF version of both the manager and employee view of the review packet. Once the manager's summary and review packet is shared, they will still have access to the PDF. Doing this will bring the manager back to the screen shown above. Finally, the manager will confirm and share the final review packet with their direct report. The employee will then get an email with a link to the feedback that was collected (at the appropriate anonymity setting) and the final manager remarks. The employee will also have a task in their dashboard notifying them to view and confirm that they have received the packet. Before a direct report can view the report, they must first e-confirm having received it. From here, the employee will see their review feedback and the ability to export to a PDF. During this entire process, admins will also have visibility into the status of the reviews (which reviewees have had their reviews shared with them, and who has e-confirmed receiving their review). Admins are also able to share the review packet with employees by clicking "Share all reviews." This will send the employee the review packet and they'll go through the same steps in receiving. Lastly, the admin has the ability to export responses. It is important to note, however, that admins and managers can only export these review packets on a person by person basis. Currently, there is not a way in Lattice to export all of the review packets at once into a single zip file.